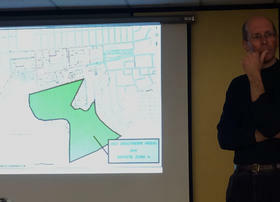 The DEC's Alex Czuhanich presents progress during a March meeting on cleanup in the area south of IBM campus in Endicott. Larry Siegel works at the Center for Public Environmental Oversight. He advocates for cleanup of areas contaminated by microprocessor manufacturers in California. WSKG’s Matt Richmond spoke with Siegel about the state of cleanup in Endicott and the next steps. SIEGEL: And it may be that what I’m proposing will serve IBM because in many cases the more innovative remedies are time-limited. That is, you inject things into the soil a few times and you’re done as opposed to running pumps year after year after year. The reason why it’s important to raise this issue now is it’s not clear when in the future DEC will be rethinking the remedy. It’s the decision they’re making now that may be permanent. So even though they’re doing a good job, now is the time to ask the long-term questions. MR: Is there a way for those homes above the vapor cloud to have a permanent monitoring or a permanent vapor removal, even if they say, ‘well, it’s cleaned up'? SIEGEL: There are technologies that have been emerging for some time now. Every year, we expect something to come on the market that would be kind of like a smoke detector, a methane detector or a carbon monoxide detector that you could put in the home and would give you an alarm when the levels go up. We aren’t there yet, but hopefully at some point we’ll have that kind of monitoring to let people know whether or not they’re safe. The same systems that were installed by IBM helped protect people against radon, which is in fact a greater health risk in most cases than exposure to TCE. Some people might choose to keep them running. But at least there’s less of a stigma on their real estate, on the value of their property, when it’s being done for radon as opposed to TCE because there are only 500 homes that need the TCE mitigation but in New York State thousands, maybe millions of homes could use radon mitigation. New York’s Department of Environmental Conservation has been working with IBM to clean up a chemical spill in Endicott for years now. At a public meeting last night, officials from the DEC gave an update on one of the contaminated areas identified for cleanup. For details on this long saga, which may be nearing an end, WSKG’s Managing Editor Bret Jaspers spoke with reporter Matt Richmond.